(e.g. 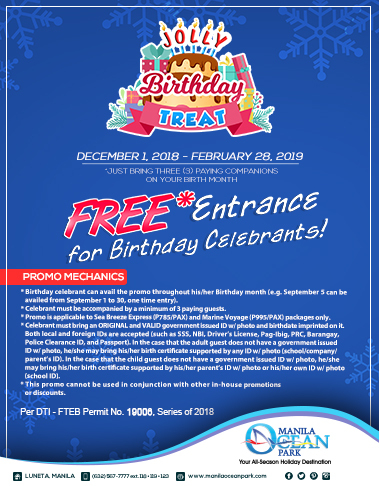 January 5 can be availed from January 1 to 31, one time entry). 2. Birthday celebrant can avail within his/her Birthday month. 3. *Celebrant must be accompanied by a minimum of 3 paying guests. 4. *Promo is applicable to Sea Breeze Express (P785/PAX) and Marine Voyage (P995/PAX) packages only. 5. *Celebrant must bring an ORIGINAL and VALID government issued picture I.D. with the birthdate imprinted on it, both local and foreign I.D.s are accepted, for proof (such as S.S.S., N.B.I., Driver’s License, Pag-Ibig, P.R.C., Barangay, Police Clearance I.D. and Passport). In the case that the adult guest doesn’t have a government issued picture I.D., he/she may bring his/her birth certificate supported by any picture I.D. (school/company/parent’s I.D) In the case that the child guest doesn’t have a government issued picture I.D., he/she may bring his/her birth certificate supported by his/her parent’s picture I.D. or his/her own picture I.D (school I.D.). 6. This promo can’t be used in conjunction with other in-house promotions or discounts. 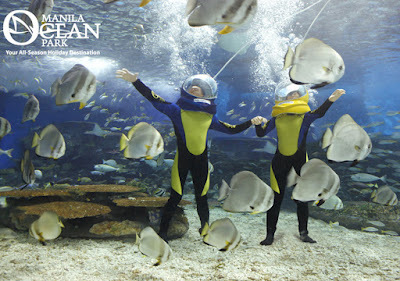 7.Manila Ocean Park reserves the right to cancel or re-schedule due to technical maintenance, inclement weather and acts of God as it deems necessary for guests’ safety and service improvement.